Race fans can visit Molokai2Oahu.com/live for live updates from the Ka’iwi Channel, or watch for updates on Facebook, Twitter and Instagram. 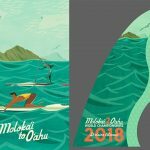 Race participants and support teams are encouraged to contribute by posting pictures, video and captions under the hashtag #M2O or #Molokai2Oahu. Race organizers will look for the best content from the Ka’iwi Channel and post to the M2O Race Day Live page. The men’s solo paddleboard division will once again be an all-out Aussie slug fest, featuring three-time M2O champion Brad Gaul. The 36-year-old holds the second fastest time in race history of 4 hours, 43 minutes, 54 seconds. Race founder Mike Takahashi believes Gaul is back to take down the course record of 4:40:31 currently held by 10-time M2O champion Jamie Mitchell. With the 2014 champion Matt Poole out of this year’s race due to injury, the door is wide open for young Rory Chapman, 25, to make a run at Gaul. Chapman’s respectable second-place finish last year (4:58:58) was just minutes behind Poole and solidified his role as a serious competitor for years to come. The men’s field will be pushed by three other Australians who are taking their first crack at the infamous channel crossing. Matt Bevilacqua, 23, is an Australian Ironman competitor and professional water sport athlete. 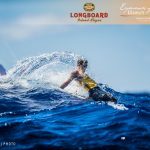 Cory Hill, 26, is the 2015 Maui Jim Molokai to Oahu Surfski champion, and Tanyn Lyndon, 22, is ranked just behind Bevilacqua in the Australian Ironman series, ranked 10th in the series. The women’s race will likely be guided by Australia’s Jordan Mercer, 21, who is paddling for her fifth consecutive M2O championship. In 2011, at the age of 17, the Australian Ironwoman pro and M2O record holder (5:22:31, 2011) was the youngest woman in race history to win the solo division at M2O. Mercer will be joined by the winningest woman in M2O history, Kanesa Duncan-Seraphin, 39. The eight-time champ established the first women’s course record (5:53:49, 2004) on a stock board, which stood the test of time for seven years before Mercer’s arrival. Duncan-Seraphin’s record still holds today as the fastest time in the women’s stock category. Newcomer Maddy Dunn, 21, joins the women’s solo competition for the first time. She is currently eighth in the Australian Ironwoman series and one of the country’s top board paddlers. This year’s men’s stock paddleboard field could offer the most competitive race in M2O history, pitting two talented Californians against a loaded Australian squad. The past three races have been defined by Jack Bark, 21, from Palos Verdes, California and Zeb Walsh, 31, from Victoria, Australia. The two have raced neck-and-neck in their previous meetings at M2O – Bark besting Walsh two out of three for top honors. But there is another athlete who has been in the mix, which begs the question: Is this Lachie Lansdown’s year? The 19-year-old Aussie finished second in 2014, setting the second fastest time in race history at 5:16:44. 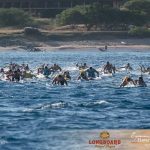 No matter the result, Landsdown, the 2015 ISA long-distance champion will make the entire field dig harder in their approach to the finish line. Enter the wildcards that will make this race boil with uncertainty. 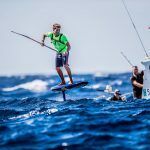 The men’s stock field will have to deal with the likes of Australian Rhys Burrows, 20, who is the 2014 ISA long-distance champion and Fletcher Davies, 19, from Australia who is no stranger to the channel, but is embarking on his first solo crossing. Lockwood Holmes, 32, comes from California with the 2014 Catalina Classic stock board championship and record (5:45:59) under his belt. Kendrick Louis, 25, is one of Australia’s top ironman competitors, currently ranked fifth in the series. And, Australian Nicholas Fox, 24, has been in Hawaii since June of this year and performing well in local races. Connor Baxter from Maui, 20, returns to defend his record-setting title from 2014 (4:08:08), becoming the outright winningest male in the SUP category at M2O. To date, Baxter has been dominating the Hawaii and California SUP scene, and will be the man to beat on race day. Baxter’s strongest challenges will again come from Australian Travis Grant, 32, who won the 2013 M2O SUP championship in a time of 4:09:15, and the world champion SUP surfer Kai Lenny, 22, from Maui. The talented Lenny added a new dynamic to the men’s race after finishing third overall in 2012 on a stock board against the top unlimited SUP paddlers (4:22:14). His 2012 time still stands as the stock SUP course record. The group will be joined by Livio Menelau, 36. The Brazilian paddler who now hails from Haiku, Hawaii and finished third in 2012 at M2O. 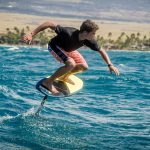 Hawaii’s Kaeo Abbey, 28, has charged the big waves at Waimea this past year and is reportedly on a mission to charge for the top spot on the podium at M2O this year. Another athlete to watch is Niuhiti Bullard, 23, from French Polynesia who took first place at the Iron Mana Liquid Festival 24-mile race in Bora Bora. The women’s race is stacked for 2015, featuring four returning champions. Sonni Hoenscheid, 33, from Germany busted the women’s race wide-open in her victory last year (5:12:38). Although it was not a record-setting run, her time stands as the second fastest women’s crossings in race history, which presents a challenging benchmark for her closest competitors. The Brazilian-born Andrea Moller, 35, from Haiku, Hawaii is back for her seventh race. She is a two-time M2O champion with the third fastest crossing in race history (5:26:51). After missing the 2014 race, Terrene Black, 32, from Australia is back to try to reclaim the top spot after winning M2O in her Cinderella victory in 2013 (5:40:40). Jenny Kalmbach, 31, from Kailua-Kona is back for her seventh race. A familiar face to M2O, Kalmbach is the first woman to finish sub-eight hours at M2O in her 2009 victory (6:18:31). Since then she has placed second in 2013 and 2014. Keep an eye out for Penelope Strickland, 36, from New Zealand who finished third at M2O in 2014, and Lena Guimaraes-Ribiero, 34, who is one of Brazil’s top female paddlers. The men’s solo stock SUP race will likely favor last year’s champ Travis Baptiste, 18, from Maui (4:23:54). Last year, Baptiste came close to breaking the course record set by Kai Lenny in 2012 (4:22:13). His closest challenges will come from Christian Bradley, 25, Hawaii, who finished fourth in 2013 and Ethan Koopmans, 18, who is one of South Africa’s top junior paddlers. The women’s stock SUP race will come down to a head-to-head battle between Hawaii’s Morgan Hoesterey and Annabel Anderson from New Zealand. Hoesterey has one of the fastest women’s finish times at M2O (5:33:23) and was the first woman to win the women’s SUP division at M2O in 2008. Anderson, 34, is recognized as one of the strongest female paddlers in the world. This year will be her second attempt at M2O after finishing third in the unlimited class (5:34:00, 2011). For more information visit Molokai2Oahu.com.